Welcome to another installment of COMEDY CORNER, where we review the movies that make the world laugh, or just try to. This week's pick is a great favorite of mine, the 1988 John Hughes comedy...THE GREAT OUTDOORS. If you are a follower of my reviews then you know by now that I love movies from the 1980's. I also love to laugh, and I always laugh when I watch this movie. 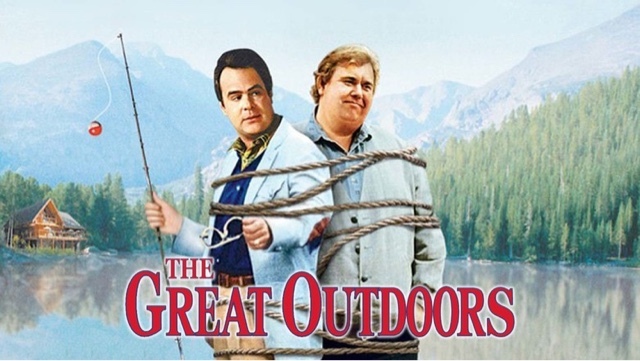 Two great reasons to watch The Great Outdoors are John Candy and Dan Aykroyd. These names carry enough weight without me having to mention any movies they've been in. If you grew up in the '80's, then you would be familiar with John Candy in Uncle Buck and Spaceballs and Dan Aykroyd in Trading Places and Ghostbusters. This film is about a family who just wants to take a nice, relaxing vacation, that is until their in-laws arrive. Family man Chet Ripley (Candy) doesn't get along with his brother-in-law Roman (Aykroyd). I must say that Dan Aykroyd plays the part of a douchebag very well. What's so funny about this movie? The comedic chemistry between Candy and Aykroyd is undeniable and without that, it would've just been another run of the mill movie about summer. There are also some great scenes! The one with the bear is hysterical. Chet tells a story about honeymooning with his wife at the same lake they are vacationing at. He was attacked by a grizzly bear and shot it. The bear ended up with a bald head after that. As Chet is trying to rescue his nieces from the mine, the bear from his past reappears. A hilarious chase ensues and the bear ends up in the house and this time Chet shoots the bear in the backside. The bear runs with no fur on his behind. I'm replaying that scene in my mind and it never gets old. Another great scene is when Chet is challenged to eat a 96 ounce steak at a local restaurant. The camera cutting from him ordering the steak to the freezer where the steak was being held gave the scene an amusing overtone. The crowd gathering around Chet as he was eating gave the scene more significance. The Great Outdoors is a childhood favorite of mine. However, it did not receive that much love from the critics when it was released. It has a 40% approval rating on Rotten Tomatoes. Nevertheless, I thought this was a funny film and much of that was due to the casting of Candy and Aykroyd. If you haven't seen this film then you are definitely missing out. Just watch out for bears and annoying in-laws.